ADC offers a full line of curtain tracks, curtain machine operators, curtain lift systems, and controls. We are the originators of stage curtain track systems, don't be fooled by imitators, we developed most of the technology currently use in the stage curtain industry and continue to innovate, design and manufactured right here in Allentown Pennsylvania. 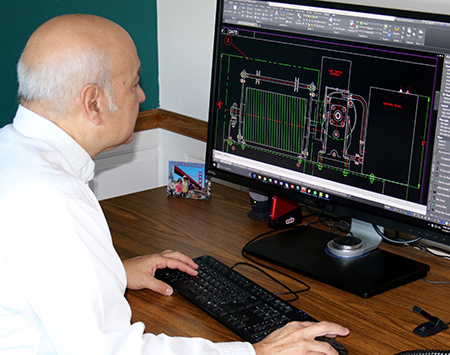 Since we design and fabricate in house, we can offer full design services, so if you need a standard part customized or a custom system developed, built and tested, we can handle it easily and quickly. We don't do rigging, we don't do lighting, we don't do curtains and we don't do scenery panels. We do curtain track systems and we do them better than anyone else out there. We concentrate on providing the best curtain track systems possible to the theatrical and architectural industries, period. If you want a time tested, engineered, craftsman grade, dependable curtain track system from a company you can rely on and one that has a proven 90 year track record, then you want an Automatic Devices Company curtain track system. Our products are sold through authorized dealers only, so rest assured you will be purchasing our equipment from someone with an extensive knowledge of our products and their installation. We are proud to be associated with this closely-knit family. Their continuing loyalty to ADC is one of the major reasons why we enjoy the reputation of being the leading, largest and foremost manufacturer of stage tracks and curtain machines in the world. "You know who you're doing business with when you do business with ADC!" This is not just a banal slogan--we mean it. When you contact us, you know that you will have a receptive and interested person working to provide you with the best service possible. As a progressive manufacturer, we pledge to improve our equipment, where possible, and to introduce new products to meet the changing needs of our industry. On occasion we are presented with applications that require custom design and fabrication. We welcome these inquiries that may require non-catalog products. The ADC staff will make every effort to supply the proper equipment to meet your specific requirements.